In today’s Gospel lesson from Luke, we are told that some leaders of the Jewish people (called Pharisees) came to Jesus after he had finished preaching to a crowd of people. They told him, “You’d better get out of here if you want to live, because Herod Antipas wants to kill you.” Herod was the ruler of the land, and he was powerful. But Jesus answered, “Go tell that fox that I will keep on casting out demons and doing miracles of healing . . .” (Luke 13:32 NLT). Jesus called Herod a fox. Why do you suppose he would call someone a fox? What do you think Herod was like? (Kids can give their ideas.) Foxes are hunters. They kill other animals for their food. Foxes also can be very sneaky. Many farmers don’t like foxes, because foxes love to kill chickens. And foxes don’t just kill for food; often times they will get into a chicken house and kill chickens just for the fun of it. Jesus called Herod a fox, so Herod probably wasn’t a very nice person. If a fox sneaked into a chicken house and met a mother hen in there with her little chicks, what do you suppose would happen? 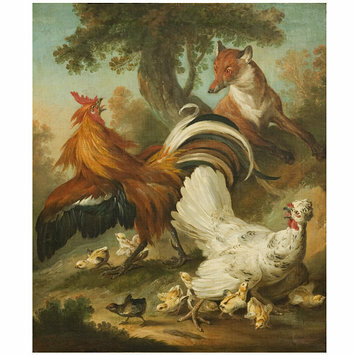 Would the hen run away or fly away from the fox to save her life? (Let children respond.) No, even if the hen were very frightened, she would stay to protect her chicks. If the fox attacked, the hen would spread out her wings, and all the chicks would run to her and hide under her wings. Then the hen would peck at the fox, trying to drive it off with her sharp beak. The mother hen never leaves her chicks, even if it means that she might be killed. After Jesus called Herod a fox, he looked out over the city of Jerusalem and said, “O Jerusalem, Jerusalem, the city that kills the prophets and stones God’s messengers! How often I have wanted to gather your children together as a hen protects her chicks beneath her wings, but you wouldn’t let me” (Luke 13:34 NLT). Jesus was willing to lay down his life for us—to die to save us from sin and death. When Jesus died on the cross, he died for the wrong things that we do, so that we don’t have to. Jesus covers us and protects us like a mother hen protects her chicks. All we have to do is go to him and let him save us and forgive us for our sins. Prayer: Lord, always keep us safe beside you. Help us never to wander away from your protecting wings.